Ice cream doesn't spring to mind when thinking about low-calorie foods, but slow-churned or doubled-churned ice cream when consumed in moderation can be a relatively low-cal snack. The slow churning process reduces fat and calories but preserves the texture of full-fat ice cream. 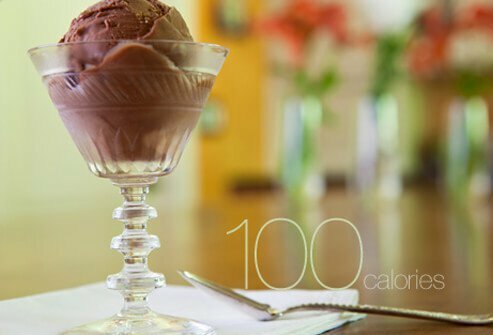 A half-cup of slow- or double-churned ice cream has only 100 calories (2 g saturated fat, 45 mg sodium, 20 mg cholesterol, and 15 g of carbs). 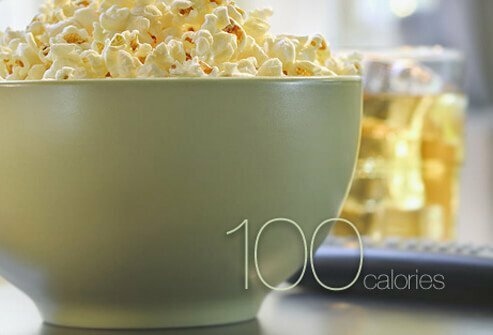 Popcorn is a well-known low-cal treat, provided you don't overload it with butter. Microwave varieties of popcorn can have as few as 100 calories in 6 cups (0.5 g saturated fat, 220 mg sodium, 0 mg cholesterol, and 24g of carbs). Its fiber content can also help you feel full longer. A mini-quesadilla can also serve as a low-cal snack when you pay attention to portion size. 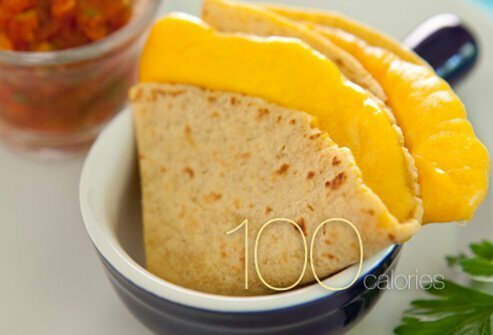 An ounce of grated low-fat cheese on a corn tortilla, microwaved for 20 seconds, makes a quick snack that contains only 100 calories (1.3 g saturated fat, 182 mg sodium, and 6 mg cholesterol). 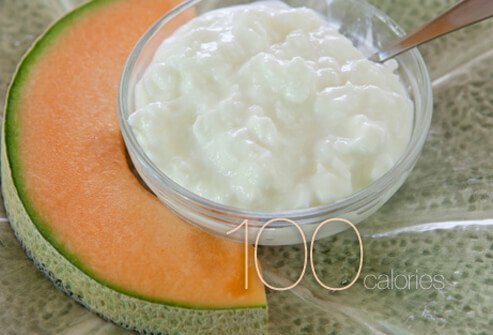 Just half a cup of cottage cheese contains a healthy 14 g of protein, which can help you feel full longer (like fiber). If you add a small slice of cantaloupe, the total calorie count still comes in at about 100 (0.7 g saturated fat, 468 mg sodium, 5 mg cholesterol). 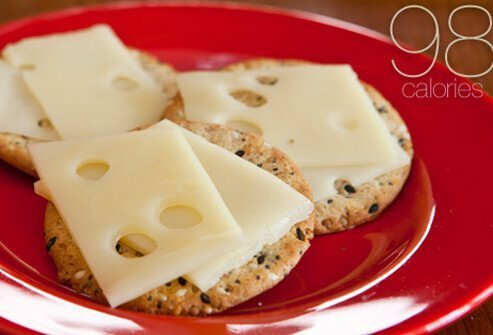 Combine whole grain crackers (full of fiber to stave off hunger attacks) with low-fat cheese for a dose of calcium and protein. For a 100-calorie snack, divide one slice of low-fat cheese among three whole grain crackers (1.2 g saturated fat, 397 mg sodium, 7 mg cholesterol). Nuts, like almonds, contain fiber and protein. They make a good snack to take with you because they're easy to store and carry. 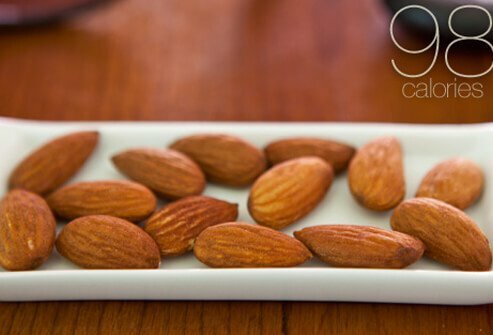 Fourteen almonds make up less than 100 calories in total (0.63 g saturated fat, 0 mg sodium, 0 mg cholesterol). Pretzels are another convenient snack to carry with you. 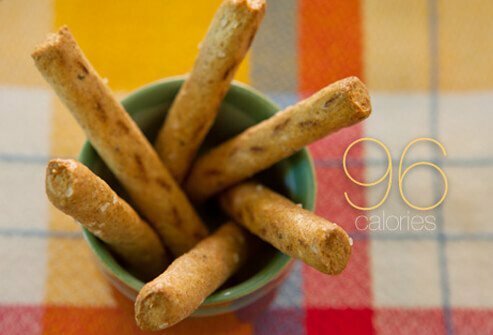 Six whole-grain pretzel sticks are less than 100 calories and have over 3 g of fiber (0.4 g saturated fat, 257 mg sodium, 0 mg cholesterol). It's common knowledge that "an apple a day" is a healthy snack, but it's also a low-cal one. 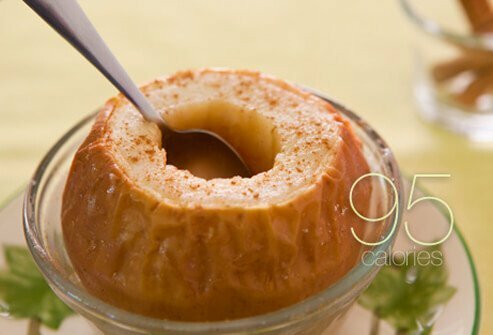 Try a new variation and have a baked apple with cinnamon. It has the same vitamins and fiber content of the fresh version. 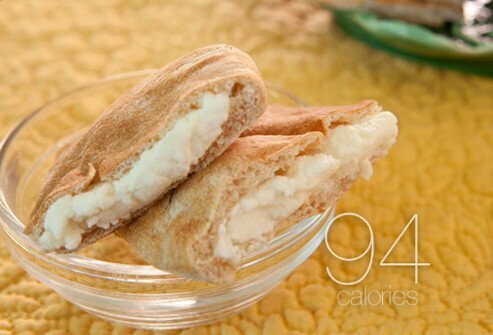 You can make an easy low-cal sandwich with a whole-grain pita pocket stuffed with half an ounce of part-skim ricotta cheese. It has less than a gram of saturated fat and contains protein and fiber to help you feel full (0.8 g saturated fat, 149 mg sodium, 4 mg cholesterol). Fruit smoothies are delicious and pack a healthy dose of calcium and antioxidants. 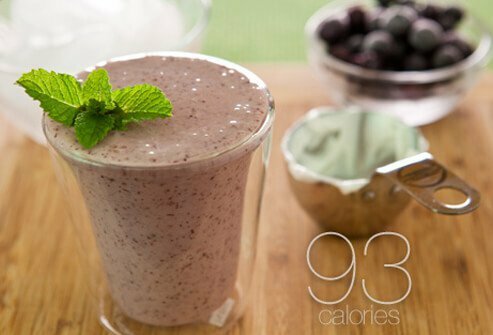 For a blueberry smoothie, blend ⅔ cup of frozen blueberries, ice, and ⅓ cup of nonfat yogurt. The cold temperature will cause you to drink more slowly, and this can mean a more satisfying snack that lasts longer (0 g saturated fat, 59 mg sodium, 2 mg cholesterol). 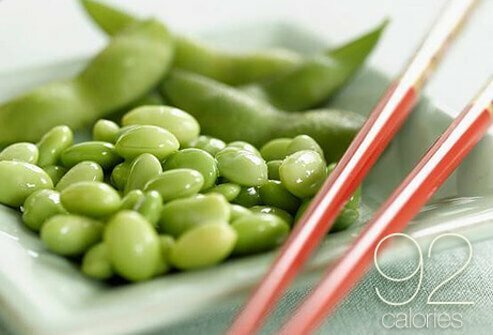 Edamame, or young soybeans, are a protein- and fiber-rich snack. One third of a cup of edamame has over 8 g of protein and 4 g of fiber. This serving size will also deliver almost 10% of your recommended daily allowance of iron. Edmamame is available in many supermarkets in ready-to-eat packaging (0.5 g saturated fat, 4.5 mg sodium, 0 mg cholesterol). Frozen mango cubes are a great snack for those with a sweet tooth. 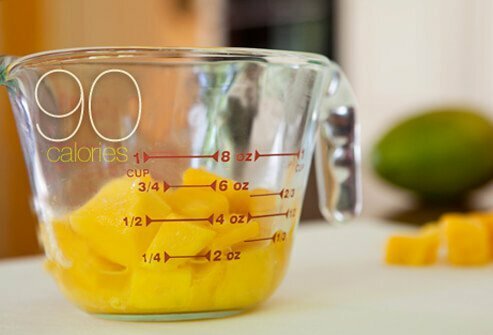 You can make them yourself from fresh mangoes or buy them pre-frozen. One serving of ¾ cup gives you 60% of the recommended daily allowance of vitamin C, yet has only about 90 calories (0 g saturated fat, 0 mg sodium, 0 mg cholesterol). 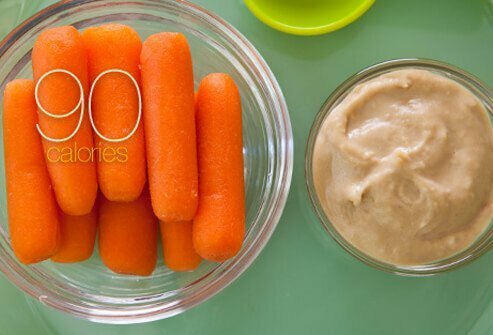 Eight large baby carrots and 2 tablespoons of hummus are a crunchy option for a low-cal snack. The carrots provide vitamin A and beta-carotene, and hummus provides protein. There are different types and flavors of hummus available in the supermarket (0.4 g saturated fat, 210 mg sodium, 0 mg cholesterol). 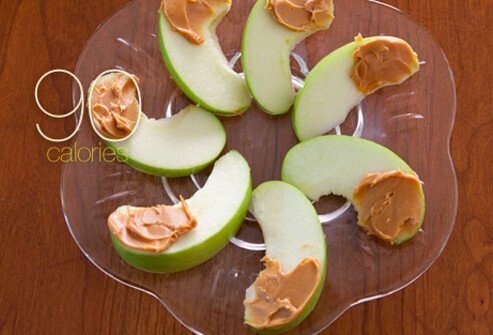 Apple slices and peanut butter offer a sweet-and-sour snack. Layer unsalted peanut butter on ¾ cup of sliced apples. Keeping the total amount of peanut butter at 2 teaspoons or less will keep the calories down to about 90 for this snack (0.8 g saturated fat, 2 mg sodium, 0 mg cholesterol). Another good source of protein is yogurt. 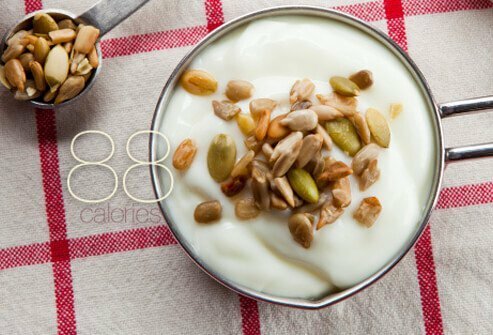 Take half a cup of nonfat plain yogurt and add a teaspoon of sunflower seeds (unsalted to keep sodium levels down) for some crunch. This snack contains less than half a gram of saturated fat and the protein will help you feel full (0.26 g saturated fat, 0 mg sodium, 0 mg cholesterol). 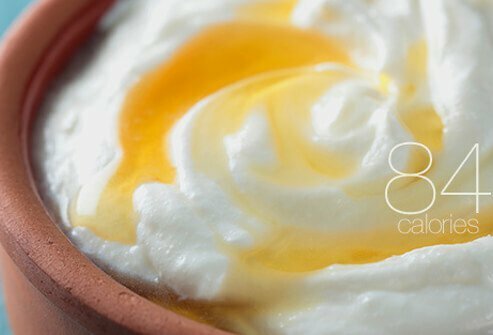 Greek yogurt has a high protein content and a particularly creamy texture. A half-cup has 12 g of protein that will help you feel - and stay - full. Adding a teaspoon of honey brings the total calorie count to just 84 calories for this snack (0 g saturated fat, 53.5 mg sodium, 0 mg cholesterol). 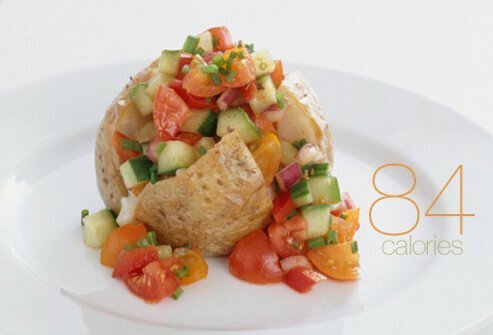 Half of a medium sized baked potato is a healthy snack at about 80 calories. Be sure to eat the skin too as it is full of nutrients. Add a tablespoon of salsa for low-calorie flavor instead of butter (0 g saturated fat, 124 mg sodium, 0 mg cholesterol). 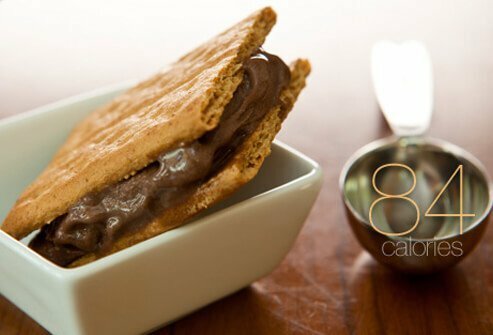 If you're craving a sweet snack, make a "FroYo" sandwich with graham cracker squares and 2 tablespoons of chocolate nonfat frozen yogurt with no added sugar. The calorie content is only 84 for this treat (0.13 g saturated fat, 104 mg sodium, 1 mg cholesterol). While pistachios have a high fat content, most of it is the "good" (unsaturated) fat. 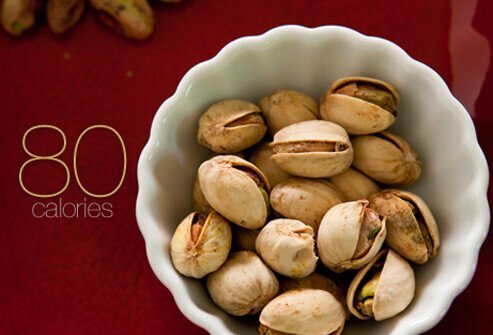 Having 20 pistachios only adds up to 80 calories and less than one gram of saturated fat. They contain fiber, protein, and several vitamins and minerals. Having them dry roasted without salt, or raw keeps the sodium content down for this snack (0.8 g saturated fat, 0 mg sodium, 0 mg cholesterol). 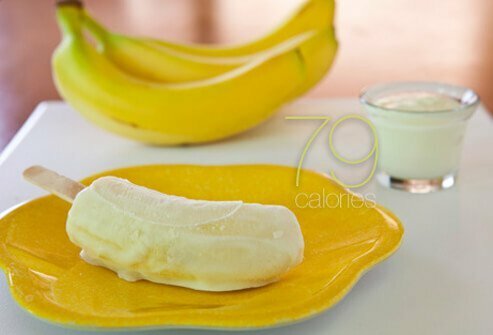 Make frozen banana pops by inserting popsicle sticks into halved, peeled bananas and coating with half an ounce of low-fat plain yogurt. Freeze the pops for a low-calorie snack that's ready anytime. The total calorie count is less than 80 per pop (0.35 g saturated fat, 3 mg sodium, 7 mg cholesterol). 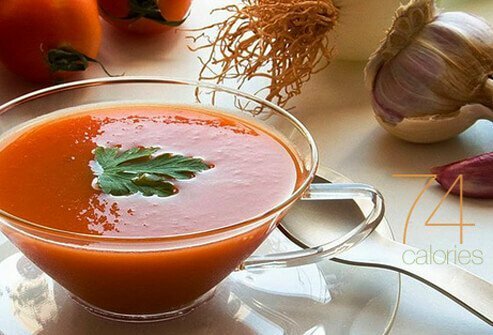 Low-sodium tomato soup is packed with nutrients and is low in calories, at just 74 calories per cup for many types. Don't confuse this with cream of tomato soup, which has lots more calories and fat (0.19 g saturated fat, 471 mg sodium, 0 mg cholesterol). Dry cereal is both a convenient and tasty snack. 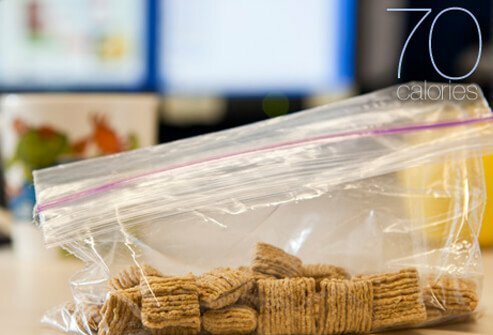 Dry oat squares or other whole-grain (non-sugary) cereals work well packaged in small baggies you can take with you. One-third of a cup contains just 70 calories (0.17 g saturated fat, 83 mg sodium, 0 mg cholesterol). 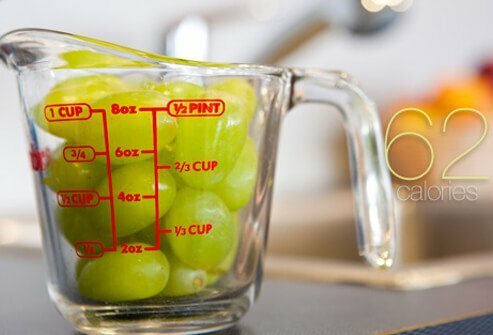 A cup of grapes has only 62 calories, and their high water content helps you stay hydrated. Grapes are a good source of manganese and vitamin K and can be enjoyed fresh or frozen (0.1 g saturated fat, 2 mg sodium, 0 mg cholesterol). 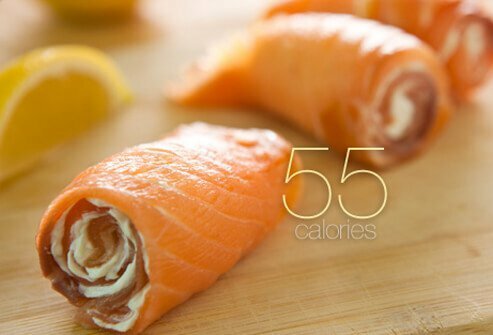 Use smoked salmon (lox) and low-fat cream cheese to make a salmon pinwheel snack that contains only 60 calories. Spread 1 tablespoon of cream cheese onto a slice of smoked salmon and roll it up. This snack contains omega-3 fatty acids (good for the heart) and is high in protein, too. The sodium used to cure the fish does raise the sodium content a bit (1.6 g saturated fat, 495 mg sodium, 13 mg cholesterol). 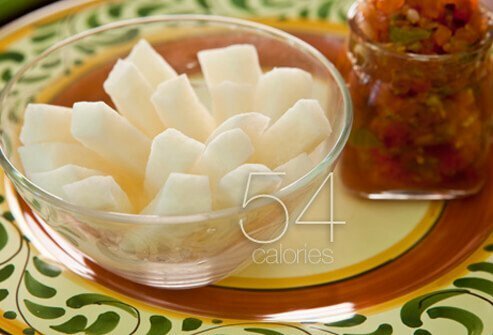 Jicama root is a vegetable snack that is very low in calories; a cup of jicama sticks is only 54 calories. Sliced into sticks, it provides a satisfying crunch. Dip the sticks into salsa for added flavor (0.03 g saturated fat, 235 mg sodium, 0 mg cholesterol). 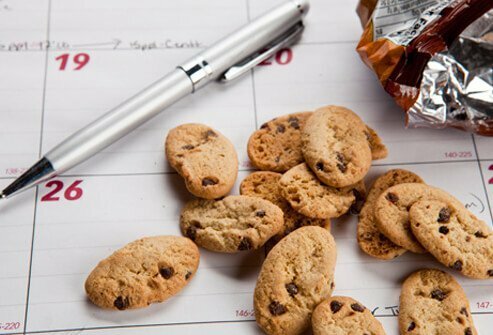 Those 100-calorie packs of cookies or crackers are designed to help cut calories, but they're not the healthiest snack choice. Most are made with refined flour and are low in nutrients. Healthier snacks like those you've seen here are low in calories but offer fiber, antioxidants, or protein. WebMD: "Weight Loss & Diet Plans Food-o-Meter."